Sometimes it's good to catch a band with next to no prior knowledge or expectations. You can be blown away by their amazingness, or just enjoy them with no prior hype. 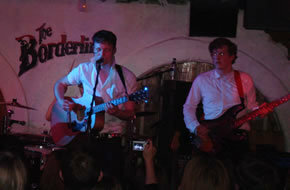 That's just what we did last night when we caught London's Official Secrets Act at the rather great Borderline. We knew of one song, so we popped down to check them and some other great bands out. Opening was Devon's Paper Heroes who have shot to fame since their song "Jenny Jones" was featured on the latest series of teen drama Skins. Delivering a welcome hit of indie pop, they are certainly more than competent, blasting through their short set with doses of banter ("come on... Come closer, we won't bite... We're from Devon after all!") and some great pop. The downside? Its all about as memorable as a Kooks b-side, and the stuff that is great is a walking talking cliché... "1,2, I love you, 3,4...", "Up, Down, All around". Really? Next up was Will and the People, whose new single "Knocking" has been getting the Radio 1 daytime fans a bit hot under the collar. Catchy as anything Scouting for Girls have put out, the songs are both funky and memorable. You can't feel that Will is stuck in the 90s though, calling his guitar the guitizzle and myspace myspizzle... Still, that shouldn't distract from a band who look set to be 2009's Hoosiers... catchy songs, snappy melodies and that marmite factor that divides opinions strongly. The headliners, Official Secrets Act sound like they'd be the perfect band to headline the cavernous Borderline with their dark brooding name. Their lyrics may be dark but their music is anything but. Fast, frantic and a lot of fun, they blasted through their 40 minute set with bounds of energy and a sense of self-assuredness. The people next to us may not have been too keen on their "cocksure-ness", however we loved it, thinking they already have the air of an Academy headlining band. The decision to put their biggest single to date, "So Tomorrow" in three songs into their set was a brave one which could have easily backfired, however we quickly realised that this is in fact a perfectly average song when compared to their others. As the temperature climbed, so did the excitement of the front of the crowd, clearly feeding off of the energy from the stage. It seems that, like so many indie pop bands of the moment Official Secrets Act have a lot going for them, and are definately one of the better ones to watch out for at the festivals this summer. Their debut album, Understanding Electricity is out now.